LET ME tell you about CRETE. 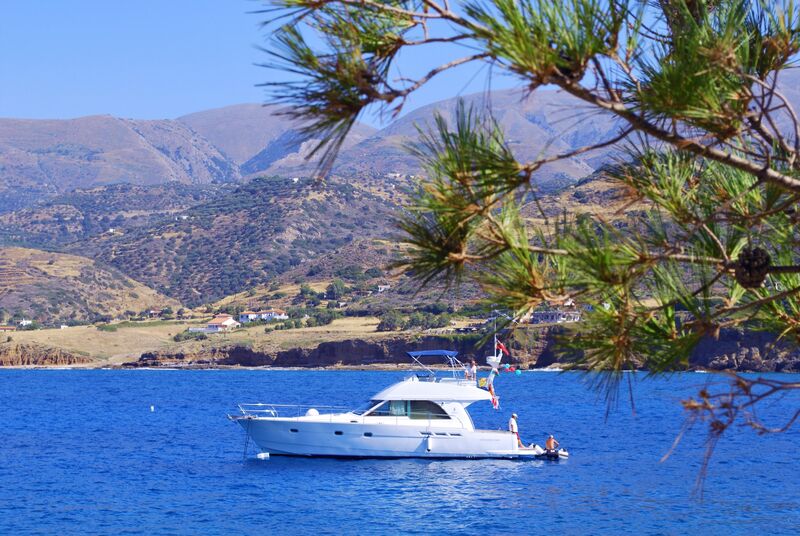 It’s a paradise island and the Cretans are wonderful people (well, most of them ….). Sarah and I began our adventures in Crete in 2001 in search of the archaeology of the Bronze Age of the Minoans (c.3000-1100BC – I’ll tell you about them next time). Sarah had dragged me ‘shouting and screaming’ (maybe a slight exaggeration) into archaeology when she came home one Friday evening and, over a glass of wine or two, asked me if I wanted to learn about archaeology (she had studied it at university in the 1980s and wanted to start up again). Anyway, I said I might be and she replied, “Good, because I have booked us both into a course on ‘Practical Archaeology’ at Sussex University starting on Monday”…….. the rest, they say, is history – well, ancient history, actually. 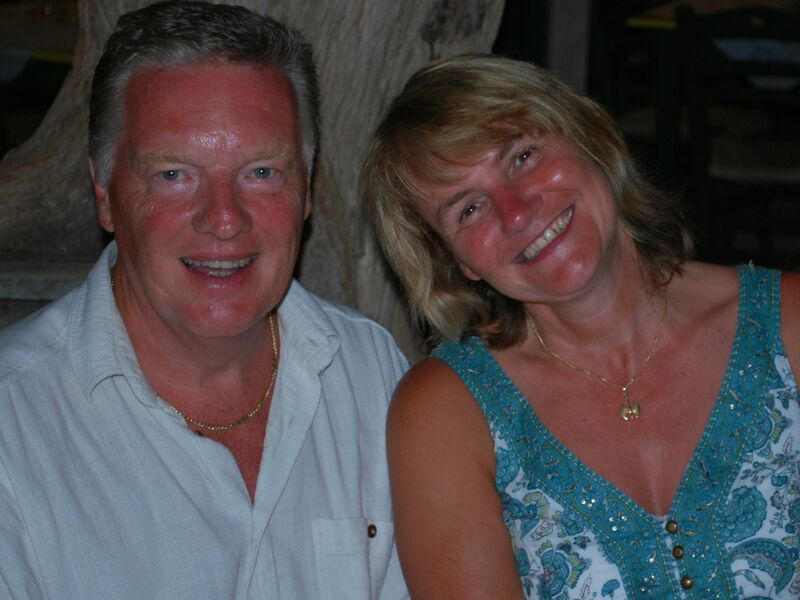 myself and Sarah always smiling in Crete! We have been visiting Crete almost each year ever since 2001, and in 2005 I began researching early British travellers to the island, particularly Richard Pococke (18th century cleric), Robert Pashley (19th century barrister) and, my favourite, Thomas Abel Brimage Spratt (19th century Royal Naval officer – with a great name!). My plan was to try to establish what, if anything, they may have discovered of the Bronze Age during their visits. Sarah and I spent five summers following these three guys footsteps around the island using their published journals. It was awful work, you understand ….. !! Oh, and you can read my book on my results – see Dawn of Discovery in ‘My Publications’ (or just click here). Then we really discovered paradise …. Mochlos. This is a small ‘fishing’ village on the north coast of the island about an hour and a half east of Heraklion and 5km off the main road. It’s no longer a fishing village as such, but, as yet, reasonably unspoiled by tourism. 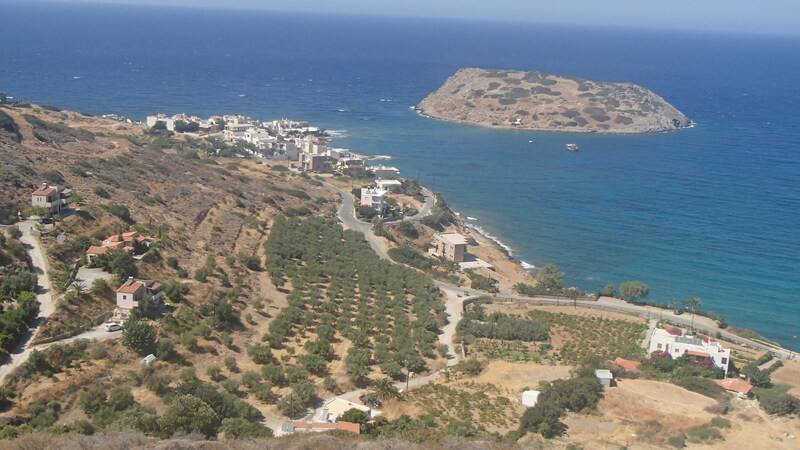 It also dates back to the Bronze Age Minoans when it (and its island just off its shores) was a thriving settlement. We struck it very lucky with our first accommodation, Mochlos Mare (click on name for link). This is a very picturesque set of apartments in a beautiful whitewashed building owned by an incredibly generous and lovely couple, Panayiotis and his wife, Sterie. They have this enormous garden which grows practically anything you can think of and they share everything in it with their visitors. 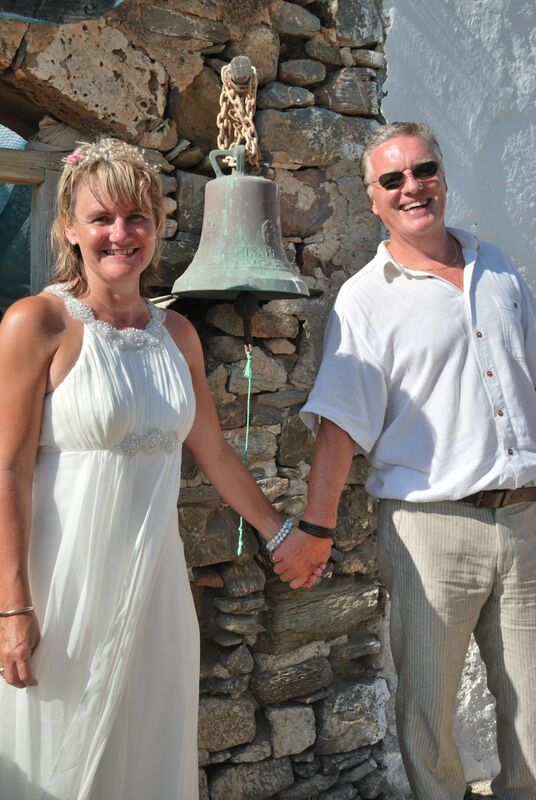 We loved the place so much that we decided to get married in Crete in 2011. We were actually married by the lake in Agios Nikolaos but went back to Mochlos on Nick’s boat to the Minoan island (top right in pic above) just off the mainland for champagne and then to Taverna Kokylia (on the mainland), for the ‘reception’. (click on name for link) – now there’s a place to reckon with. Owned by the fabulous Yiorgo (George) it is simply the best! He did us proud on our wedding day and has done so ever since on our anniversaries ……. and all the other times we have been there! Then there is Dimitri’s (click on name for link), which is also a great taverna. He is a lovely chap and his food is excellent. I recall one wonderfully musical night there last year when our good friend, Warner (visiting us from UK), played his violin, whilst a young chap from Sweden played his guitar and his girlfriend sang. It just wouldn’t happen in the UK! In 2012 we decided to stay the whole summer holidays in Mochlos (3 months) and came to the conclusion, sadly, that Mochlos Mare was not big enough for a stay of this length of time. We needed a bigger kitchen at least as we planned to cook-in on occasions (had to for this period of time!!). However, we found an absolutely fantastic apartment, Alexandros (click on name for link – you should be getting the idea now), just up the road from Mochlos Mare. 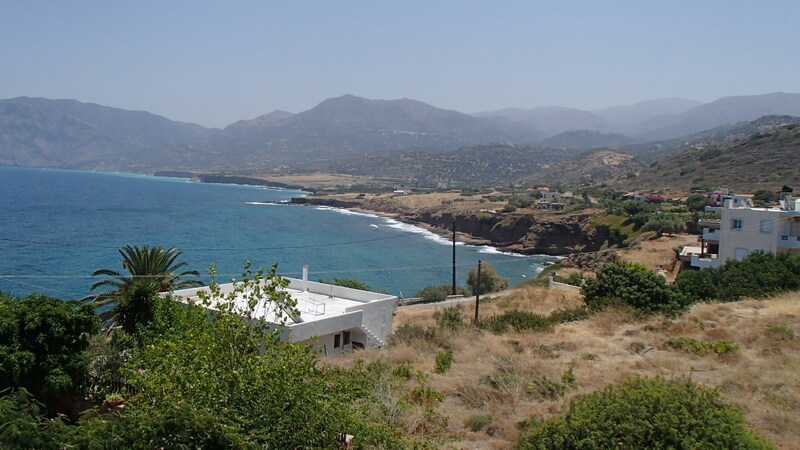 It is owned by two lovely Australians, Peter and Rosa – Peter has Cretan connections hence his desire to buy a property on the island. Fortunately for us he and Rosa chose Mochlos! 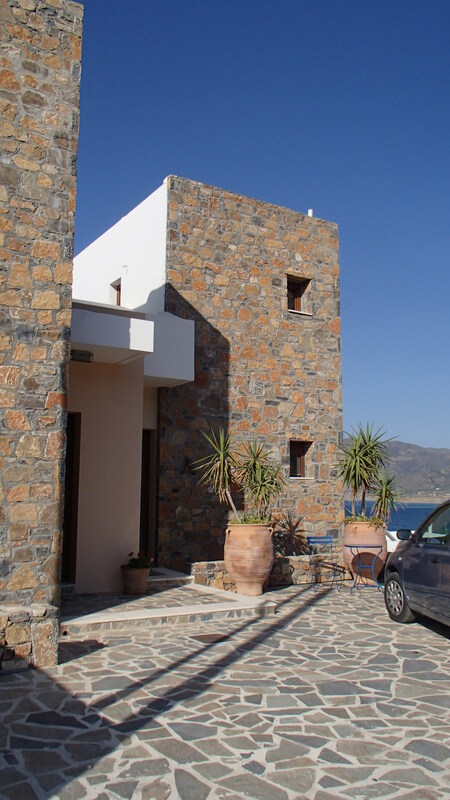 2013 also saw us in Mochlos (and Alexandros) for another 3 months over the summer again – and Nick’s fantastic villa was finally completed (he had bought the plot some 6 years ago!). The last time I had seen Nick and Heather (other than in Mochlos) was over 20 years ago in Wales. Then, 20 years later, I heard they had bought a plot of land in Crete – in Mochlos!! Small world or what? So that’s how I found Crete. 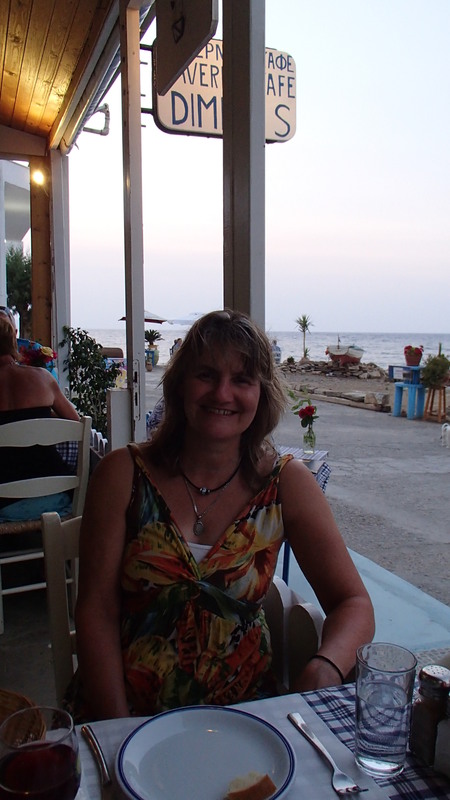 Sarah produced blogs on our time in Crete in 2012 and 2013 (click on dates if you are really interested or just suffer from insomnia). Next week let me introduce you to the Bronze Age Minoans of Crete. I recall as a student, at my weekly tutorials at Oxford, it was a requirement to produce an essay for discussion. One week, I fear I neglected to make such an effort and I decided to ‘blag it’. 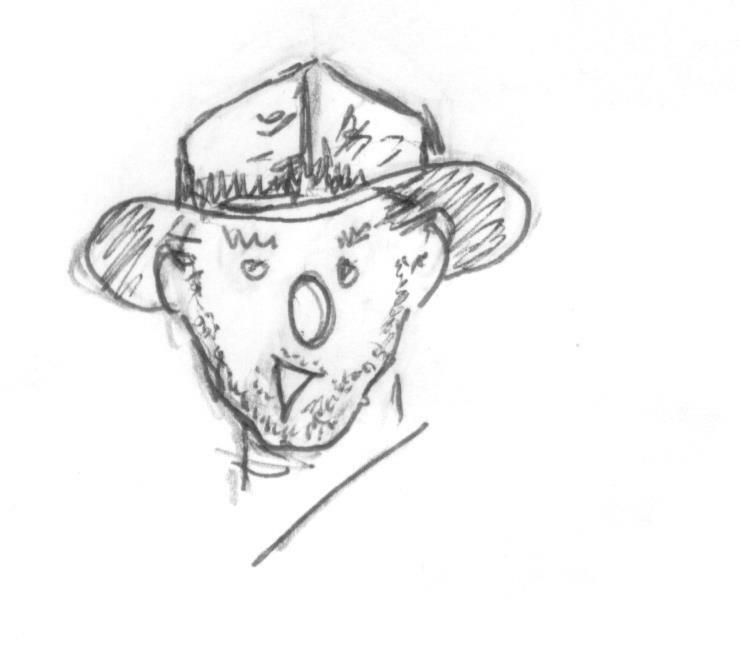 On appearing before my tutor, Professor Sir Lucius Bodmin-Wallbanger, I opened my notebook and with, I have to report, some skill and imagination, pretended to read from it, turning the blank pages at appropriate intervals. Following a formidably inventive conclusion, I shut the notebook with great satisfaction, thankful that the performance had passed off smoothly, and awaited Sir Lucius’ comments. Thank you for all your comments. 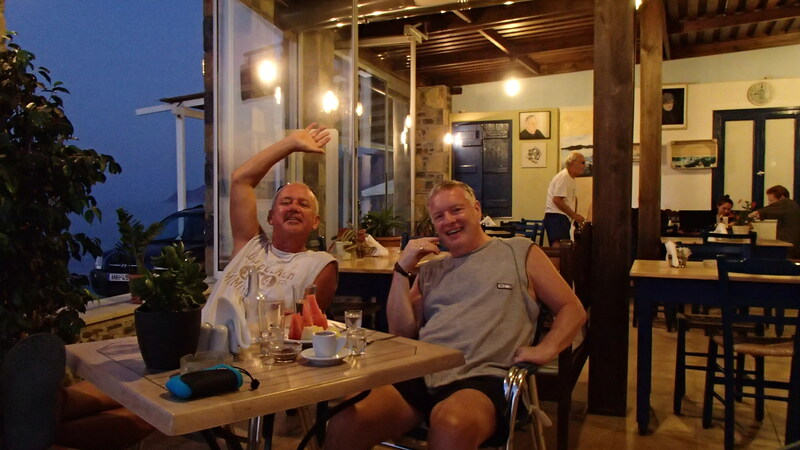 You just cannot beat Crete – such a great place and lovely people. Enjoyed the history and we even got a guernsey! Thanks, Dr Dud. You both looked fabulous on your wedding day. I was thinking of Mochlos only the other day when biting into the first apricot of the year – not even in the same league as Mochlos ones! I’m thinking of going with the Ramblers at Christmas to Chania and Kastellis. A good idea? Or will it be too cold? Are there any archaeological sites that far west? Have a wonderful time in Mochlos again in the summer. It’s not that warm in December – you’ll need your winter woollies! And it does rain heavily on occasions. Saying that, a couple of years ago Panayiotis sent us a picture of Mochlos island in glorious sunshine on New Year’s day (but don’t rely on that!). Not so many archaeological sites in the west – certainly not of the same ‘quality’ of those mid and east Crete. I’ll email you a plan.